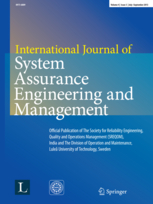 InternationalJournal of System Assurance Engineering and Management is a quarterly Journal of the Society for Reliability Engineering, Quality and Operations Management (SREQOM), India; and the Division of Operation and Maintenance, Lulea University of Technology, Sweden. International Journal of System Assurance Engineering and Management is established with a view to cater to the increased awareness for high quality research in the seamless integration of heterogeneous technologies to formulate bankable solutions to the emergent complex engineering problems. The Journal provides a platform for the modeling and analysis of large engineering systems, leading to the enforcement of performance enhancement measures. Achieving a fine balance between theory and practice is the primary focus of the Journal. Service engineering and service design.